Sometime in May my co-teacher mentioned to me that there is a lot of Eastern medicine tourism in Korea, and my first thought was Why didn't I think to do that earlier?! 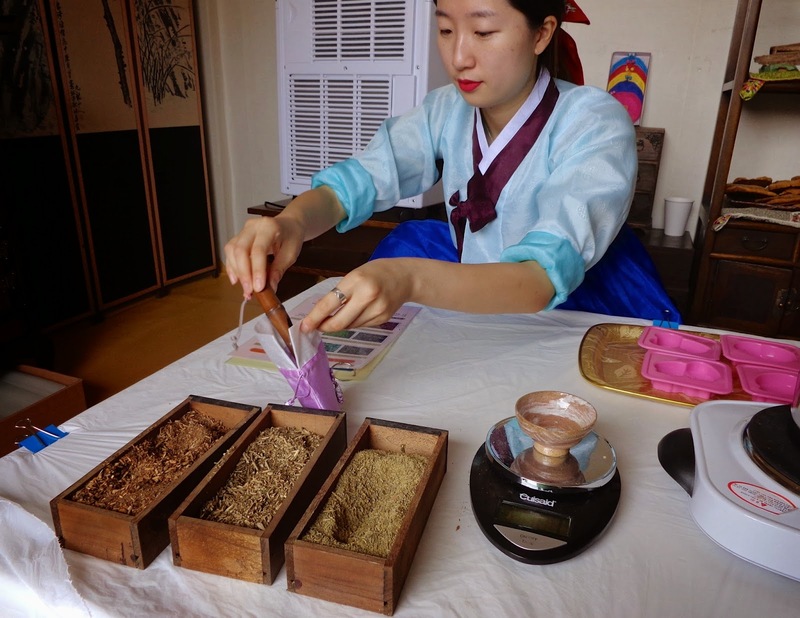 Here in Korea, where Eastern medicine thrives, is the perfect place to take advantage and learn more about the traditional medicine. Luckily it wasn't too late. 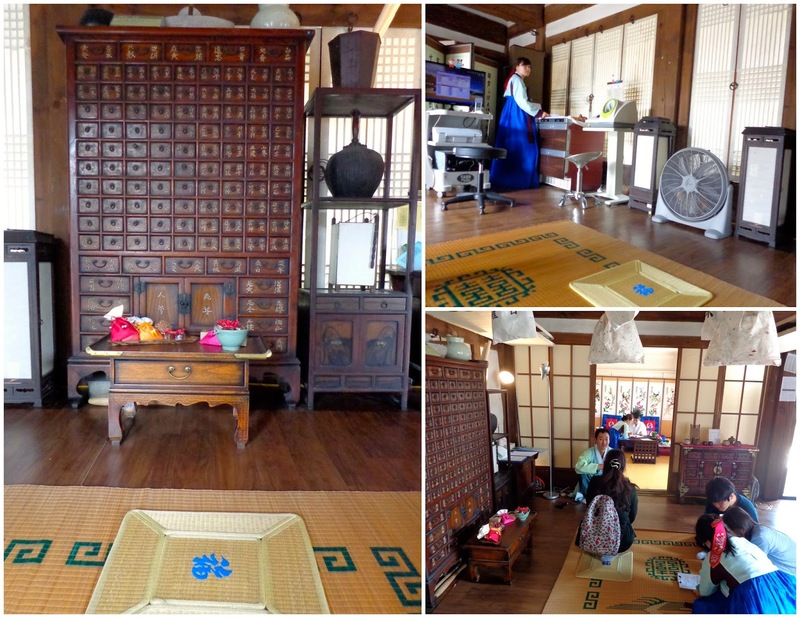 Yesterday I had a "Korean Traditional Medical Tourism Experience" in Yun Taekyeong's Jaesil of Namsangol Hanok Village. It was great! But it almost didn't happen at all. 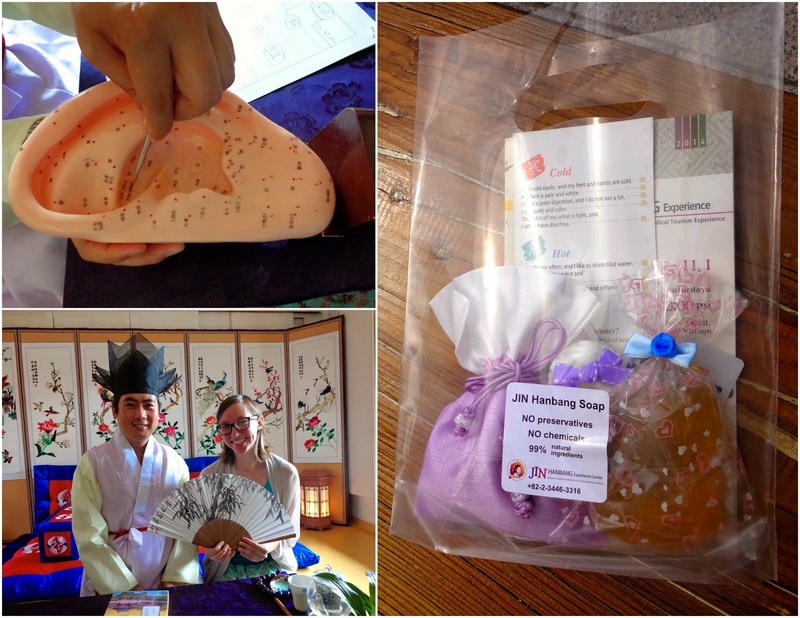 When John and I went to Namsangol Hanok Village, I picked up a brochure for their "Jin Hanbang Experience - Korean Traditional Medical Tourism Experience." There is no website for the 2014 Jin Hangang Experience, which is quite unfortunate because I think many more foreigners could enjoy the experience if information about it was more easily accessible. The brochure did not have prices, but rather the line "Please contact +82-10-7189-0827 for reservations, ticket prices, and additional details." So after John left I made it a June goal to make an appointment for this Korean traditional medicine tourism experience. The first time I called the number, it went directly to an automated message in Korean, which was followed by its English translation. It basically said to call back at another time, but made no mention at all of the traditional medicine experience. So I'd try calling during school breaks and after lunch, thinking I had called too late the first time. But no matter when I called, I kept on getting that same message. I had nearly accepted defeat, thinking I'd have to make the trip to Seoul the following weekend just to make a reservation in person, when I tried again. This time I called the second phone number listed on the back of the brochure first, which was for Namsangol Hanok Village. A Korean man answered, and we could not communicate, so I eventually hung up. Then I went back to the original number that you're supposed to call for reservations, and tried adding a zero in front. This actually got it ringing, so I wonder if that was the problem in the first place. Then it went to an automated voice with two choices, and you were to press either 1 or 2 on your phone. It was all in Korean, so I didn't know what either choice was, but I pressed a random number. Then I called again and pressed the other number. It sounded like I was to leave a message on one of them. Anyway, after all of my various calls, all of a sudden my phone was ringing. Normally I ignore phone calls from numbers I don't know, but I had the brochure in front of me and could quickly confirm that the medical tourism experience office was calling me back! And then I set up my appointment for this past Saturday. I was warmly welcomed when I arrived back at the second house in Namsangol Hanok Village. I filled out a very brief health history/information half sheet to start. Then it was explained to me that in Eastern medicine, people's bodies are generally categorized into one of four types, but many foreigners get confused so here they just stick with two: hot and cold. She showed me a list of bulleted statements under each category, and I was to say where I thought I fell. It was a really easy question, as all of the health statements under the "cold" category applied to me. She made me some tea that helps "cold" people become "hot" (Note that these labels don't simply refer to temperature, but also temperament and other bodily tendencies). This tea was served in an adjoining room where I went next to make an aroma pouch and soap. The soap takes about 40 minutes to set, which is why they had me do that before the rest of the appointment. Since I have a "cold" body, the kind woman (I forgot her name!) showed me how to make an aroma pouch with "warm/hot" scents. My bag has cinnamon, wall gardenia, and fennel. I measured out 8 grams of each in the little bowl on the scale before dumping them into the pouch, but then she gave me some extra afterwards (as captured in the picture). Next came the soap, which I made at the same table. I stirred some of the base cubes until they had melted down, and then she poured in the scent and oil that helps "cold" people. I got to select the mold from four choices, so I went with the strawberry shape. After I poured the hot liquid into the mold, she sprayed on something that would prevent it from having air bubbles. And then it was back out to the main space for the start of my check-up! 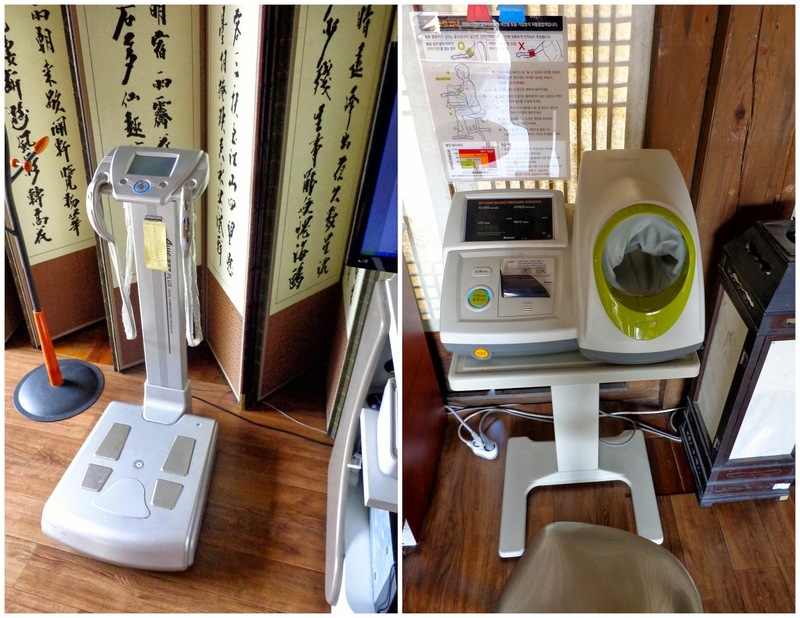 First she took my blood pressure in this neat machine (pictured right). You just put your arm in that sleeve hole and the machine does it all. When that was done she asked for my height. Oh no, she probably wants this in centimeters, I realized. I had totally forgotten what my height is in centimeters, since it's been a while since I've used the number in Spain. So she estimated it for me! (I'm 167 cm I think, future me, coming to this post to check). Then I was weighed on the scale (pictured left), and lastly I had to picked up those two handles and hold them over my head while some other measurement was being taken. And then it was time to meet the doctor! The doctor spoke to me in Korean, and then that wonderful woman translated really well after each sentence. And the doctor was so kind and funny! Very approachable. We talked about my symptoms, various ways to ease them with Eastern medicine, and then we went ahead with acupuncture in my ears. He explained, using a gigantic plastic ear (below), that when you turn the ear upside down it closely resembles a fetus in the womb. So different parts of the ear are associated with different parts of the body. He had these tiny acupuncture band-aid type things. There were two kinds, one with beads and one with a sharper point. They're really small squares with a bead or point in the middle. You adhere it, like a bandaid, to the right spot in your ear and leave it for three days. I said I was fine with the sharper ones, so he peeled off the cover and stuck the small square on my left ear. Then he placed another on the right ear. You can faintly feel it, and he said I can press on them whenever I need the extra help. He gave me a set of eight of the bead acupuncture band-aid things to take home and use whenever I wanted. He made sure I took a picture of him pointing out the exact spot in the ear, so that I can have a friend put them in the right place. Then we got to discussing my spinal fusion and spinal issues. He said that in Korea they still have Western operations when necessary, but they like to follow it up with some Eastern post-treatment. I hadn't had any post-treatment from my fusion, so he suggested we do a session of "cupping". I had never heard of cupping therapy, but it's when suction is created on the skin to promote blood flow and healing. You leave the "cups" on for 5 - 15 minutes, and it'll leave a mark that lasts for around five days. When they were first explaining it to me, the woman accidentally said "The mark lasts just about five years." before correcting herself right away - it was funny. So I went into another room for a 10-minute cupping session on my back. I could feel when certain cups lost suction, but there was a different woman who stayed in the room during, and would come over and re-suction any that needed it. I have some awesome purple circles on my back now! Afterwards I took a picture with the doctor on their polaroid (I haven't taken an instant photo in a long time, it was neat! ), and had them do another on my digital camera. The woman gave me a nice bag of my soap, aroma pouch, polaroid, rice wine soap, and an informational brochure about what teas/herbs you should stick to depending on if you're hot/cold. Everything was really well organized and presented. Everyone was very kind and helpful, and had great English! 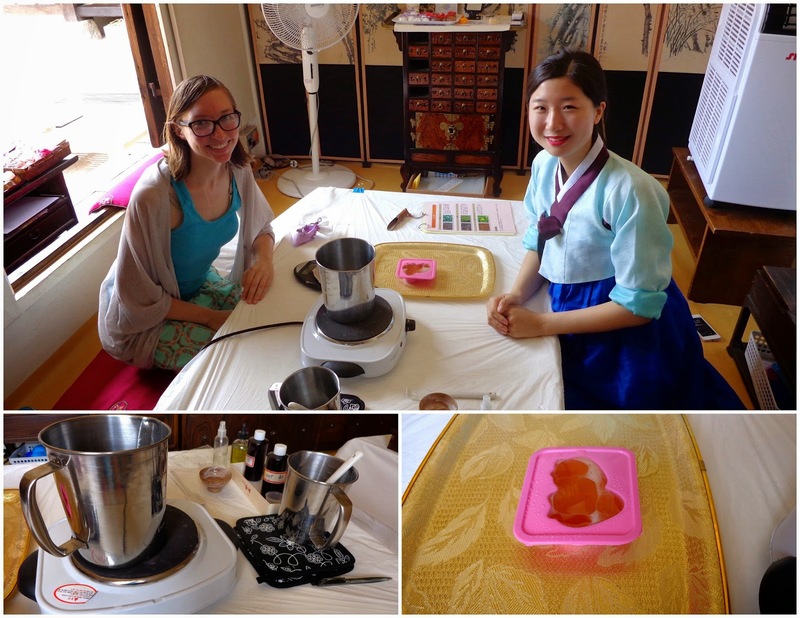 If you want to learn more about Eastern medicine, I highly recommend the 2014 Jin Hanbang Experience at Namsangol Hanok Village. Cost: The program I did cost 20,000 KRW, but depending on what you would like to do, they have various programs that cost 5,000; 10,000; 20,000; and 40,000 KRW. Reservation: Call +82-10-7189-0827 to make a reservation, or I'm sure if you were there in person visiting the traditional houses, you could see if they had a spot open that very day. Did you learn what the four types of people are, beyond hot and cold? Yeah, I found just a few sites that mention the Four Constitutional Types: "greater yang, lesser yang, greater yin and lesser yin". I'm assuming most of the online literature on the topic is in Korean.